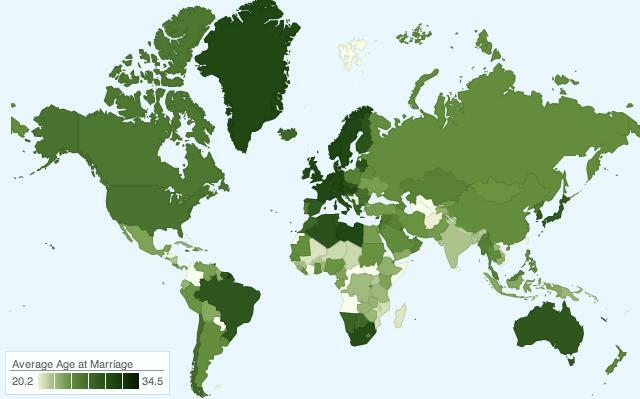 At What Age Do People Get Married Around the World? Priceonomics collected data from the United Nations to come up with very interesting conclusions on at what age people get married at around the world. Here are some of their findings! “The biggest differentiator of marriage age seems to be a country’s income, with people in developed countries marrying later. Nordic countries and Western Europe rank among the highest for mean age at marriage at above 30 years. Afghanistan has one of the lowest at 20.2 years. “It remains common today for women to marry very young in some developing countries. Thirty nine countries have data showing that 20% of women married by age 18. In twenty countries, a full 10% of women married by age 15. In only 2 countries, however, are 10% of men married before the age of 18. Still, men and women are getting married later in every region of the world. The average age of marriage for women increased from 21.8 to 24.7 years from the seventies to the mid 2000s, with the average age for men rising a comparable amount. This has resulted in some fairly dramatic stats here in the United States. Today, less than half of American adults are married – down from 72% in 1960 – and almost as many babies are born out of wedlock as to married couples.